The University Technology Centre for Computational Engineering is funded by Rolls-Royce Plc. and based in the Computational Engineering and Design research group (CED). Our basic aim is to apply modern computational tools, methods and environments to problems in aerospace engineering and related fields for the benefit of Rolls-Royce. We have particular expertise in the fields of design search, robustness, optimization, cost modelling and the use of advanced geometry manipulation schemes. 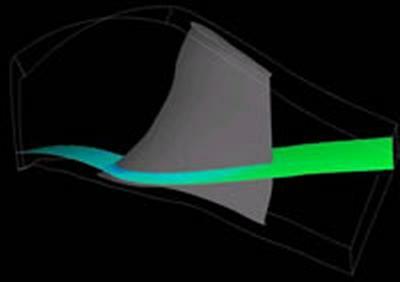 We have access to a wide range of computational facilities including a dedicated supercomputing cluster with hundreds of 64bit processors and licenses for the aerospace industry's principal CFD and FEA codes. We are always interested in collaboration with others active in this field. We sometimes need new research staff for particular projects. These are always advertised at jobs.ac.uk when available so please check that site before contacting us directly. We currently have a number of fully funded PhD studentships tenable by UK, EU or overseas studentships. These pay full fees and living expenses. If you would like to apply for one please apply online - further details on the application process can be found within Postgraduate opportunities. Please state that you would like to join the CED group and are seeking a full scholarship. Please also indicate the area of study you would like to engage in and any particular research interests and we will then assess your application and match it to our staff profile.